Ever heard of Ona? Up until last week, we hadn't either. Turns out, Ona's a purveyor of "fine" camera bags and accessories, and given that it's the holiday season, we figured it prudent to have a gander at the outfit's latest and greatest -- you know, just in case you've a camera lover in your family who you've yet to buy for. The all-new Union Street ($279) is quite clearly an upscale messenger bag on the outside, but the internals are arranged in a way that the amateur photog / gadget lover would appreciate. There's room for a few pens (of the lens and / or ink variety), a smartphone, a navigation system, a 15-inch (or smaller) laptop and -- according to Ona -- a DSLR along with three lenses. The other notable aspect is the waxed canvas exterior (dubbed Waxwear), which is generally more rugged and weather resistant than your average patch of suede or leather. How's it all shake out? Join us after the break for our pair of pennies. Truth be told, you've got a cornucopia of options when it comes to shopping for a messenger bag. 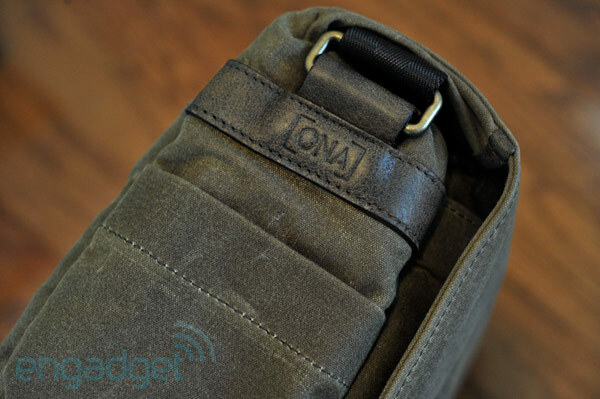 Where Ona attempts to differentiate itself lies solely in the design. When we heard just how much this unit was supposed to hold, we were actually somewhat surprised to see how reasonably sized it was -- it's a large messenger bag internally, but it doesn't look bulky at a glance. In fact, it looks striking, and totally professional. It's available in a trio of hues (Ranger Tan, as seen here, as well as Smoke and Black), and it's definitely a bag that could be carried by your average suit-and-tie wearer. There's a well-stitched rear grab handle as well as an adjustable neck belt; thankfully the latter has a comfy, adjustable pad for easing the stress on your shoulder and neck. Contrary to what you may expect, the front isn't closed by buckles; those are there to loosen the front for more bulky loads. Underneath are a pair of clips, which are far, far easier to lock and unlock with one hand. We'll just be frank with you -- this thing oozes class. As soon as you pick it up you know you're dealing with quality, and while it's shockingly light (that's a good thing! ), the waxed canvas exterior really is rugged. Running through a brief rain shower? No worries -- it'll bead right off. In use, we found it quite comfortable to hoist over our shoulder. 'Course, we feel the same way about our trusty Timbuk2 messenger bag, but it's important to note that we weren't overwhelmed at any point by the size. So, how's about the internals? There's a padded interior and a handful of dividers with velcro on each side; if you find that you'd only like to use one or two, you can rip the other out without issue. 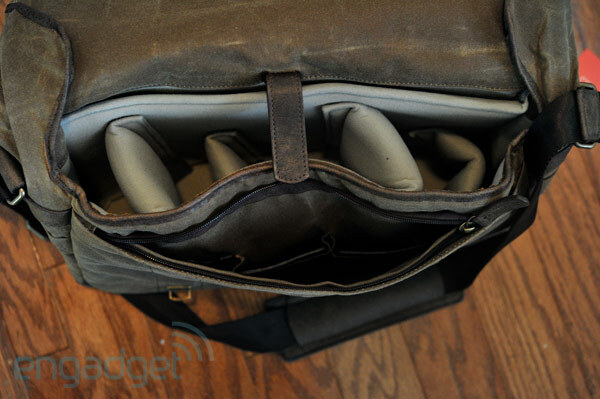 We were able to squeeze a Nikon D90 (wearing a 50mm prime lens) as well as two other lenses and a SB-600 flash inside of the bag, not to mention a 15-inch MacBook Pro. That said, the aforesaid arrangement left very little room in the zippered accessory pouch -- anything more than a smartphone, a few pens and a sleek PND simply wouldn't fit. But that's a loaded-down scenario; in truth, Ona is aiming this is at more casual users who aren't planning to take their entire rig from place to place. For that, the size of the Union Street is ideal. We will say that our MBP fit mighty snugly in the rear, but we suppose that's the point -- there's no doubt that 13- or 14-inch ultraportables would fit a lot easier. If you're looking to lug around more equipment than this, a backpack is still the best option. Is the Union Street really worth $279? If you're in the target market, it definitely is. The point of this product isn't to be the cheapest or most value-friendly; it's a luxury item through and through, and those who aren't looking for a luxury messenger bag won't be able to justify its purchase. 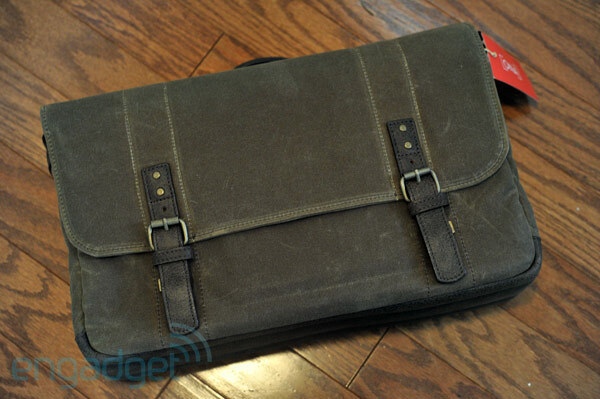 But when you consider that a similarly sized Timbuk2 messenger bag sells for $130+, it starts to make a little more sense; this one's designed specifically to hold a full-size laptop, a small camera setup and your mobile gizmos, all while looking good enough to take to a job interview. Is it pricey? Of course, it's a luxury product. Is it well-built, well-designed and downright drool-worthy from top to bottom? You bet. If you've got the cash laying around and are in need of a new messenger bag, there's hardly a reason to look any further -- if you're still balking at the price tag, we're sure that sack you used to haul textbooks in middle school will get the job done.